Helvetica is a popular sans serif font that's been around since 1957. Linotype licensed it to Adobe and Apple early on, and it became one of the standard PostScript fonts, guaranteeing widespread use. In addition to the versions listed in this article, Helvetica exists for Hebrew, Greek, Latin, Japanese, Hindi, Urdu, Cyrillic, and Vietnamese alphabets. There's no telling how many Helvetica fonts are out there! When Linotype acquired the Helvetica font family, it was in disarray with two different names for the same version and variations in design features. 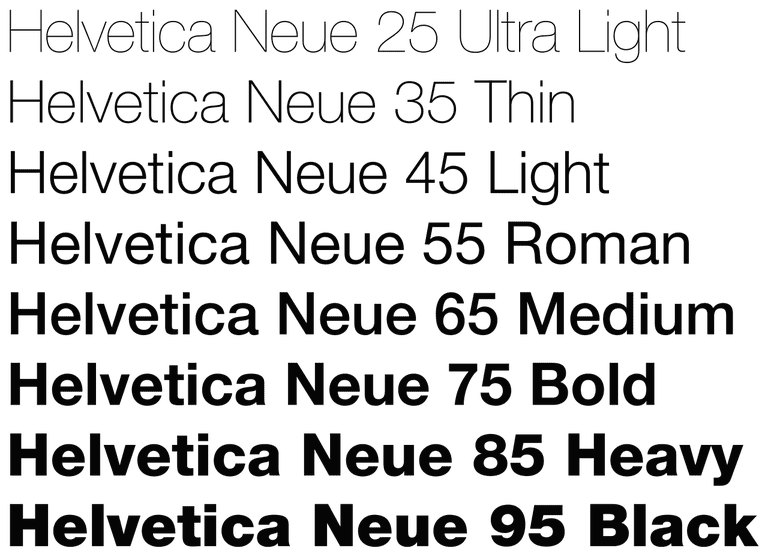 To make order out of it all, the company redrew the entire Helvetica font family and dubbed it Neue Helvetica. It also added a numbering system to identify all the styles and weights. The numbers distinguish the many variations within Neue Helvetica. There may be (and probably are) subtle and not-so-subtle differences between Helvetica Condensed Light Oblique and Helvetica Neue 47 Light Condensed Oblique. When trying to match fonts, you may be happier using one over the other. Some fonts are listed more than once with a slight variation (Black Condensed and Condensed Black, for example) because different vendors list one name instead of the other. This list may not be complete, but it's a start in listing all the various flavors of Helvetica. Some vendors carry the Neue fonts without the number designation or without the Neue designation. Additionally, some vendors reverse the names slightly. 37 Thin Condensed and 37 Condensed Thin are the same fonts. Often Oblique and Italic are used interchangeably as well. Only one version name is included here. There are both "old" Neue versions and the versions that include the Euro symbol. Ask your vendor if you're getting the "with Euro" version.